I checked with Eric today to see if he would like any cookies made for Sunday dinner. Everyone else had stuff going on and he and Rachel were popping over. I like it when they give me different food ideas. He said he wanted Brownie Cookies. I checked around and found a recipe at Food Network that I thought I would try. Here is this very simple and delicious recipe. 1. Place bittersweet and semisweet chocolate in top of double broiler. Add softened butter. Stir until melted. Take off heat and set aside to cool. 2. Using an electric mixer (I did not use my stand up mixer), beat the eggs and vanilla until frothy. Add 1 cup of sugar gradually until the mixture ribbons off the beaters. Add the cooled chocolate and stir to combine. 3. 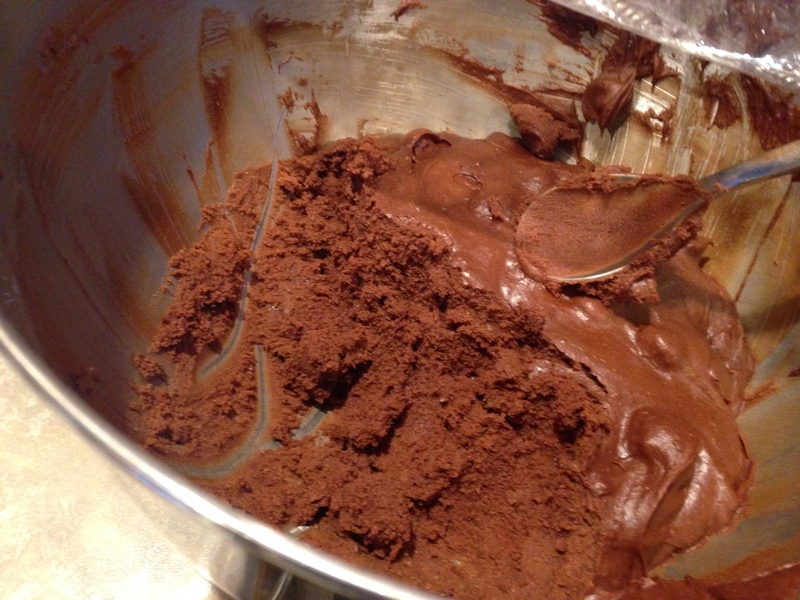 Add the dry ingredients to the chocolate mixture and stir to combine. 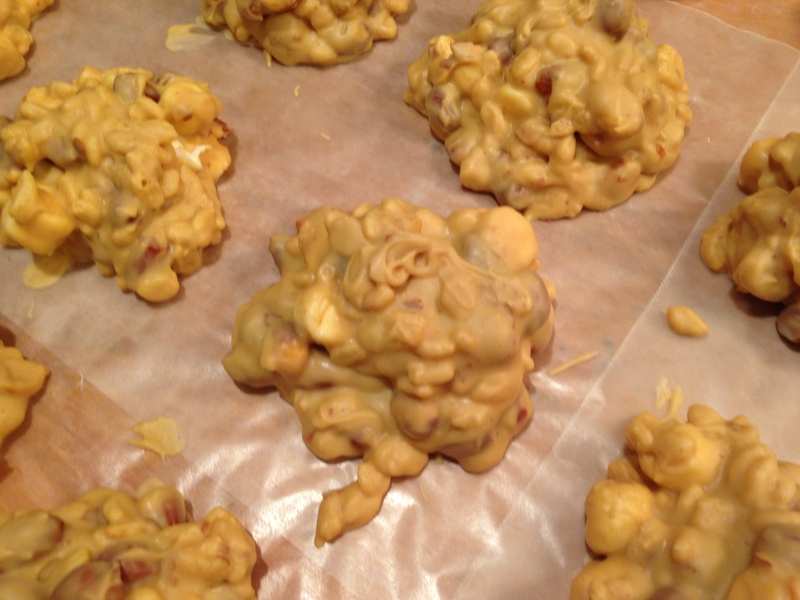 Fold in the milk chocolate chips and nuts (if using). Cover bowl with plastic wrap and put in refrigerator to chill. 5. Scoop up dough and roll into ball the size of a walnut. Place on prepared cookie sheet 1 1/2 inches apart. 6. Bake for 12 minutes. I time 6 minutes and then turn the cookie sheet around. Bake for 6 more minutes. 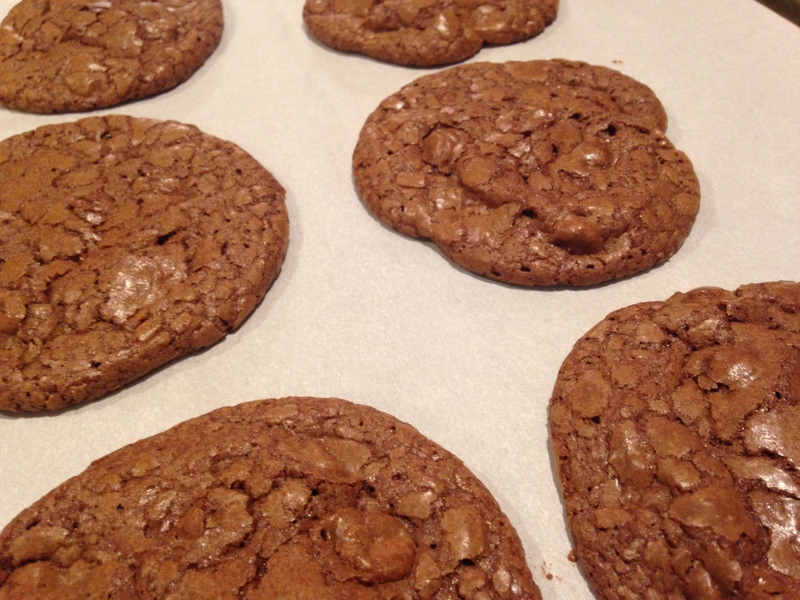 The top of the cookies will look dry and cracked like a brownie. Take out to cool. We loved these cookies. 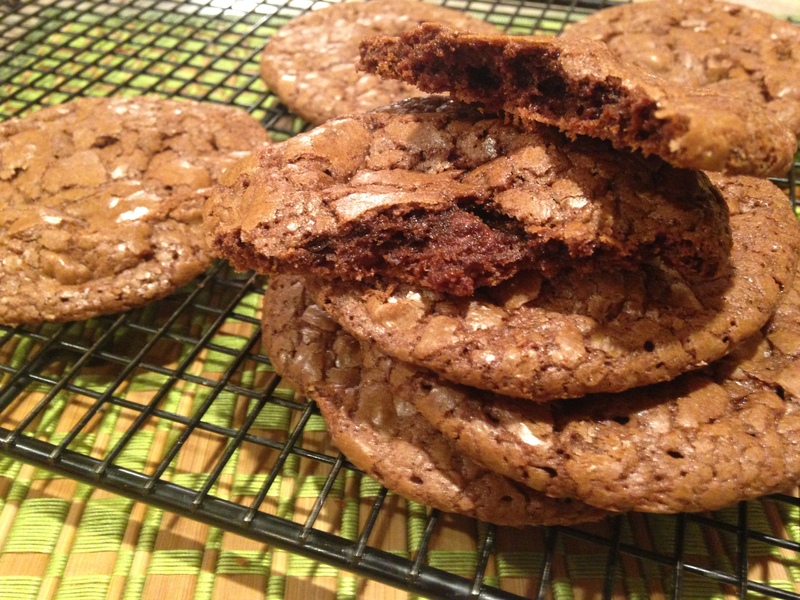 Even Kent liked them Not too chocolatey but definitely a yummy brownie cookie!! Simple and Delicious!! 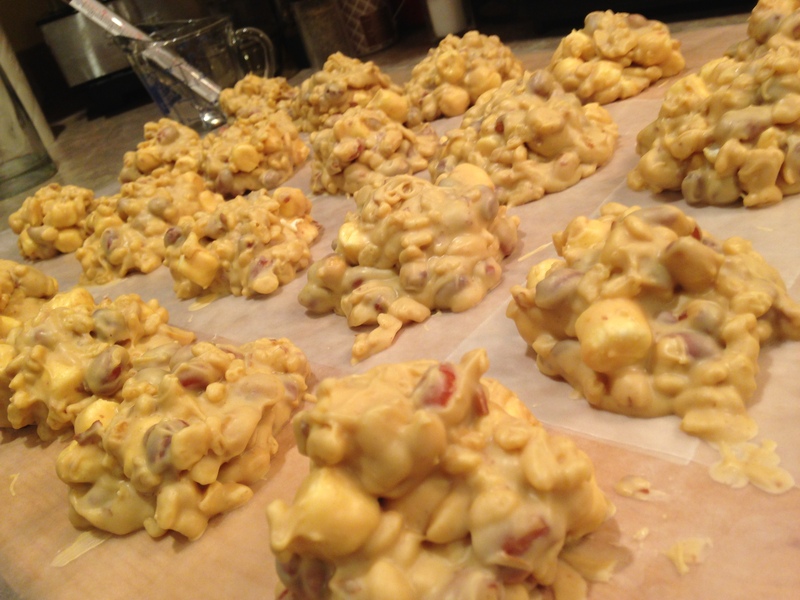 I am experimenting with candy recipes this holiday season. Everyone in this house enjoys chocolate and peanut butter. I found this recipe and thought I would give it a try. It takes 15 minutes, tops. You need to try this. Myself, Rachel and Martin2 really enjoyed it. Eric said it was okay (thought it was kind of grainy). Not sure what Lily or Martin thought of this one. I will know tomorrow night for sure. Needless to say 3 of us could eat the whole 8×8 dish of it so I would say it is a winner. Simple (simpler than simple) and Delicious! 3. In a small sauce pan (stainless steel again) stir together the peanut butter chips, remaining sweetened condensed milk and 1 teaspoon butter until all the peanut butter chips have melted. Stir in 1/8 teaspoon vanilla extract. 4. Pour the chocolate mixture into the prepared pan. Using spatula, smooth out the top until level. Drop the dish from 1 inch high, 2-3 times to release air bubbles. 5. Dollop the peanut butter mixture evenly across the chocolate. 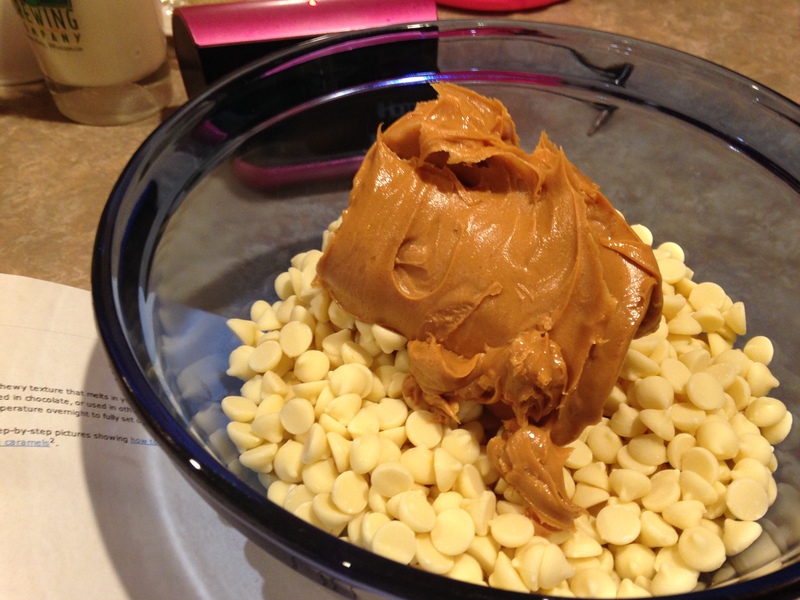 Using butter knife, swirl the peanut butter into the chocolate. I asked my mom what I could do for a gift for dad this Christmas. My Dad has Alzheimer’s. His short term memory is shot. Not so sure about the long term memory either. He lives in the moment, the exact moment and that is it. Anyways, being the foodie I am she said he would like Peanut Brittle and a Chex Mix. At first I thought I could go to Seroogy’s (a local candy store) and get the Peanut Brittle there. Then I thought, why not, I will make it myself. I am not a candy person. So I wasn’t sure if I would succeed. I found this recipe on Epicurious and it worked perfectly! Dad won’t remember it minutes after he eats it but he sure will enjoy it while he is chomping on it!! 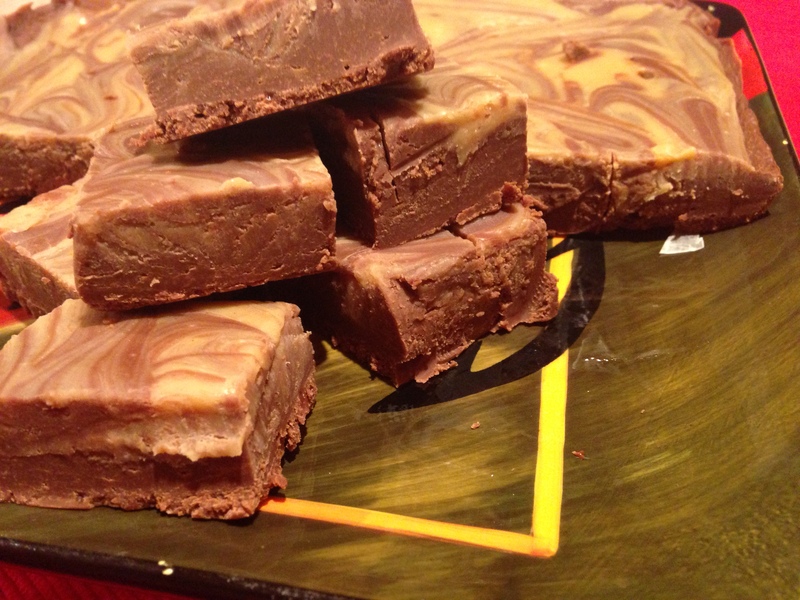 2013 UPDATE: This recipe continued to work for me this year. No changes in temperature. I still did the 260 for first boil and then 295 after adding the nuts and butter. My combination of nuts this year was 3 cups of salted roasted cashews and 1 cup salted pistachios. Once again, delicious! I happen to like this recipe a little too much. I may hold out in 2014 and make for 2015 or…maybe not! 2. Stir first 4 ingredients in heavy large saucepan (I used my Dutch Oven pan) over medium heat until sugar dissolves. 5. Add baking soda and vanilla and stir briskly (mixture will foam up). 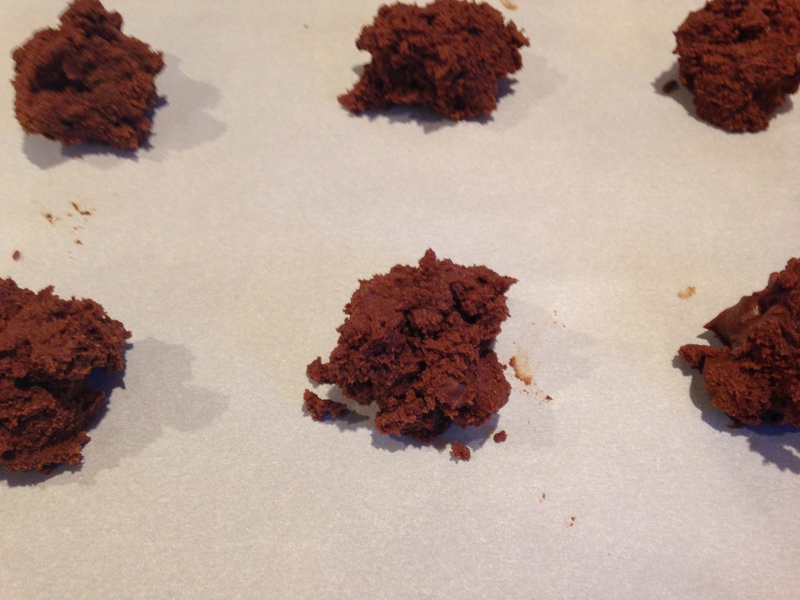 IMMEDIATELY pour out onto prepared baking sheets, dividing evenly. 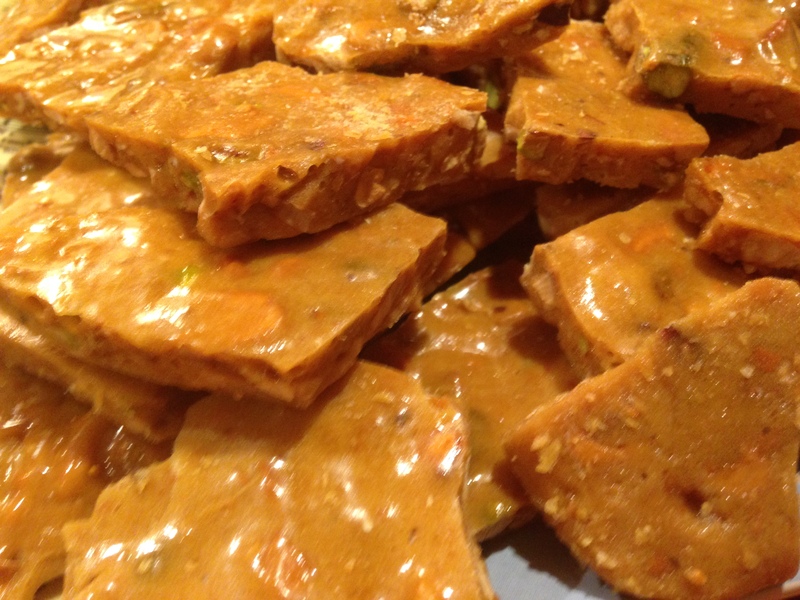 Spread out brittle as thinly as possible. 7. When set, break brittle into pieces. IT IS DELICIOUS!! 8. Store in airtight containers at room temperature. This was the easiest recipe I have done in quite a long time. Martin wanted to make this for our Christmas baking day. Martin2 brought this home over the weekend when he visited his mom for their baking day. (Confusing, huh?!) Martin2 gave me the recipe. This is a treat they have made in their family for the holidays for a long time. Now we will be making it too! (maybe not just for the holidays) 😉 You will want to make it also because it is incredibly simple, fast and DELISH! 1. Line a cookie sheet with wax paper. 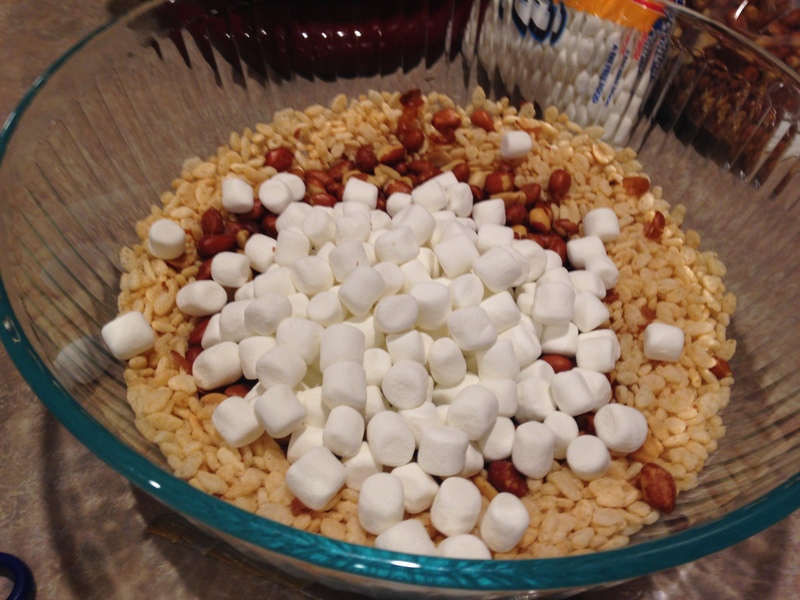 In a large bowl, combine the Rice Krispies, peanuts and marshmallows. 3. Stir chocolate mixture into the cereal mixture. 4. We used a 1/4 measuring cup and dropped onto waxed paper. After we emptied the bowl we put the cookie sheet in the cold garage to set. (You can use your refrigerator too. Mine was pretty full. Good thing it is 20 degrees here!) We let them set about 2 hours. 5. Store in an airtight container or storage bag. Either works. This took us no time at all! Enjoy! Martin and I had our annual Christmas baking night last evening. He chose candies to make this year. We did a very simple Rice Krispie treat, caramels and Lokum (or as you may know it, Turkish Delight). Martin has enjoyed Lokum since he was a young child when he lived with his grandparents in Bulgaria. He found a recipe and wanted to give it a try this year. It was a nice change making candy this year. It takes a long time and there is down time where you can enjoy each others company. The Lokum came out quite tasty and Martin said it was just like what he was used to in Bulgaria. Here is the recipe, compliments of about.com. One thing I recommend is to have everything all prepared. You may think you have time when the temperature reaches that magic number but you never know. Be prepared! 🙂 Another suggestion; this recipe made LOTS of Lokum. Next time we make this I am cutting the recipe in half. This may be time consuming but this was a very simple and delicious treat! 1. Prepare a 9×9 pan by lining it with aluminum foil and spraying the foil with nonstick cooking spray. Set aside. 2. Place the sugar, lemon juice, and 1 1/2 cups of the water in a medium saucepan over medium heat. Stir until the sugar dissolves, and bring the mixture to a boil. Brush down the sides of the pan with a wet pastry brush to prevent crystals from forming. Insert the candy thermometer. 5. Once the sugar syrup is at 240 degrees, remove it from the heat. Slowly pour into the cornstarch mixture, whisking until it is fully incorporated. 6. Reduce the heat to low and simmer, whisking every 8 minutes, for an hour, until the candy has turned a light golden yellow color and is very thick and gluey. 8. The next day, remove the candy from the pan using the foil as handles. 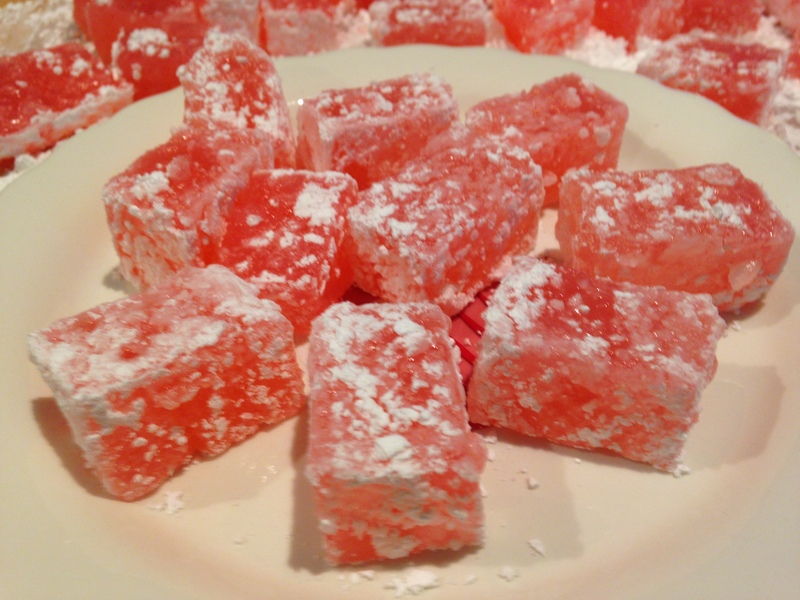 (Lokum has a soft, delicate, jelly-like consistency.) Dust your work station with the powdered sugar and flip the candy onto the powdered sugar. Remove the foil from the gack and dust the top with the sugar. Use an oiled chef’s knife to cut the Lokum into small squares. Dust each side of the square with powdered sugar to prevent stickiness. 9. This treat is best soon after it is made. It does not keep well. You can store in an airtight container with waxed paper between the layers and dust the sides with powdered sugar again before serving. Martin’s appetizer request; Crepes (or Palachinka as Martin calls them) with a cheese spread. 2. 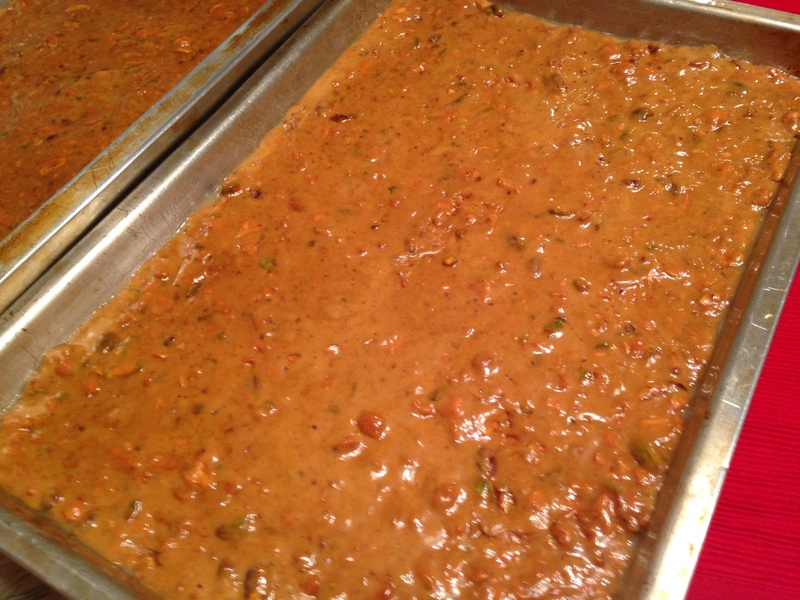 Take out of refrigerator and gently stir batter if ingredients have separated. Heat a 6-7 inch pan (I use a non stick 9 inch skillet) over medium heat. Brush pan bottom and sides very lightly with butter, which should sizzle when it hits the pan. 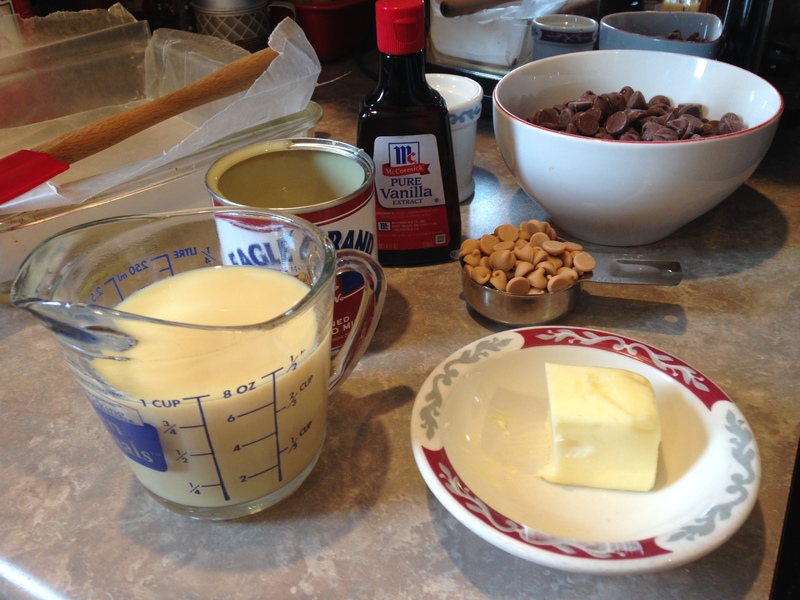 I use just under a 1/2 cup of batter (for my size pan, if you use a smaller pan you will need to use less batter). I put the batter in middle of pan, lift off the heat and rotate, covering the entire bottom of the pan. Set on burner and let cook for 30-45 seconds, flip it over and cook same amount on other side. Martin loves the cheese spread for these just barely sweet crepes. Nutella, jam or preserves are also a great filling. Thanksgiving gives us plenty of leftover turkey. Kent loves pot pies. He also loves biscuits. I threw this together last weekend. Personally, I would prefer chicken. However, I had lots of leftover turkey and that is what I used this time around. 1. Heat oven to 450 degrees. In 9 inch pie plate place the pie crust. 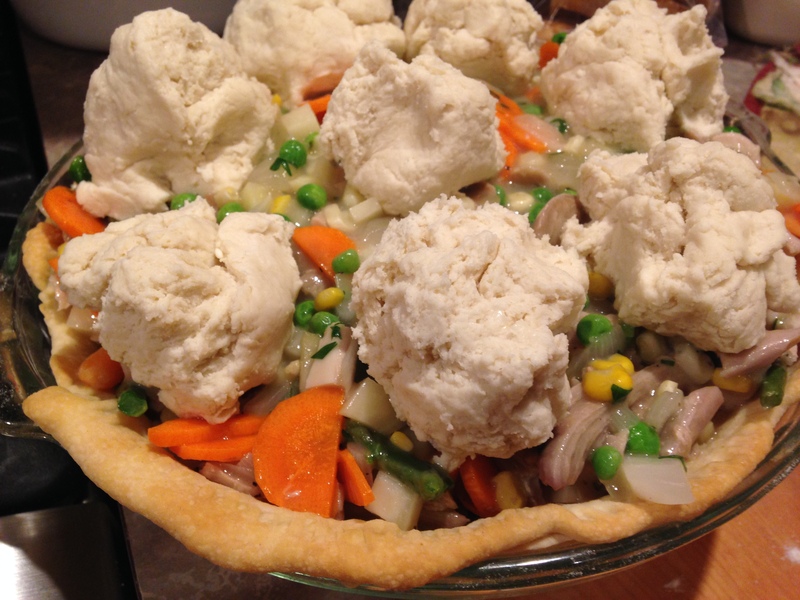 Poke holes all around the pie crust, bottom and sides, with a fork. Prebake in oven at 450 degrees for 5-10 minutes. Take out to cool. Lower oven to 400 degrees. 2. Meanwhile, in a 3 quart saucepan, melt butter over medium heat. Add onion, cook until softened. Beat in flour with wire whisk. Gradually beat in broth and fresh herbs. Reduce heat to medium low, cook about 5 minutes, stirring occasionally, until sauce thickens. 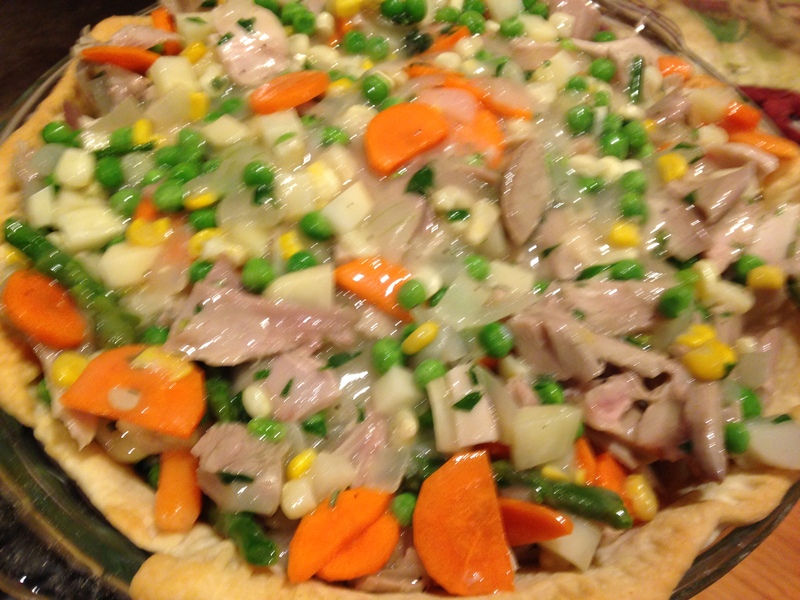 Stir in vegetables and turkey into sauce. Spoon mixture into pie crust. 3. Place biscuits on top of mixture. 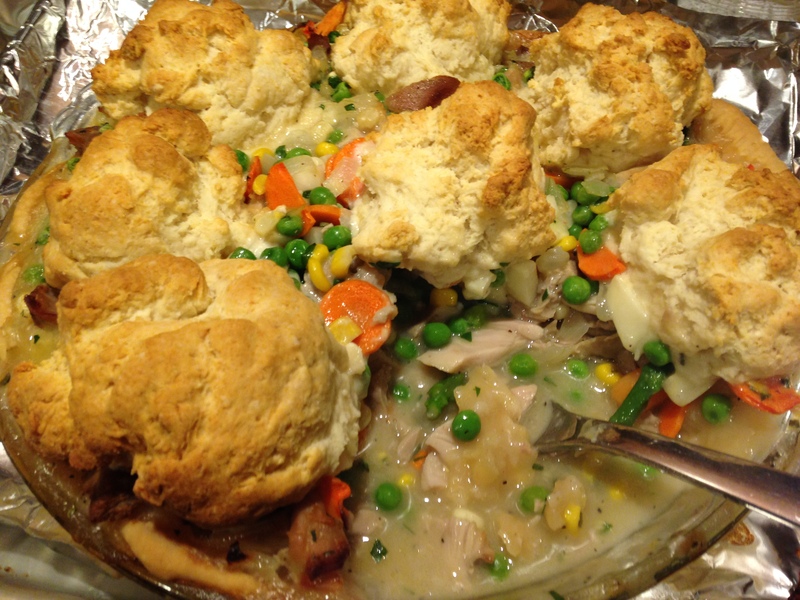 Bake at 400 degrees for 25-30 minutes or until biscuits are golden brown. This is simple and delicious, anytime of year! I made plenty for Thanksgiving this year. 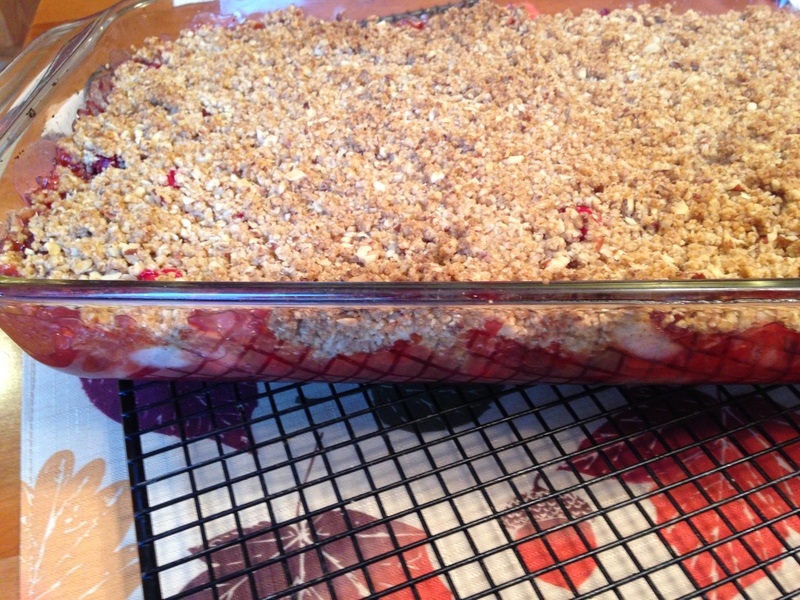 However, the best recipe for me was the Cranberry Pear Crisp. I get Food Network Magazine and this recipe is from the November issue. This was a hit in our home. Most everyone enjoyed this recipe. I also baked a pumpkin pie (I don’t bake pies) which I was told was delicious and my usual cheesecake. Plenty of desserts to pass around that is for sure! 1 pound cranberries (thawed if frozen – I used fresh) Did you know Wisconsin is the leading produce of cranberries in the U.S.? 1. Preheat oven to 375 degrees. Combine the fresh and dried cranberries in a large bowl. Add 1 cup sugar, 3 Tablespoons water (I did not add the water) and the vanilla. Toss and coat. 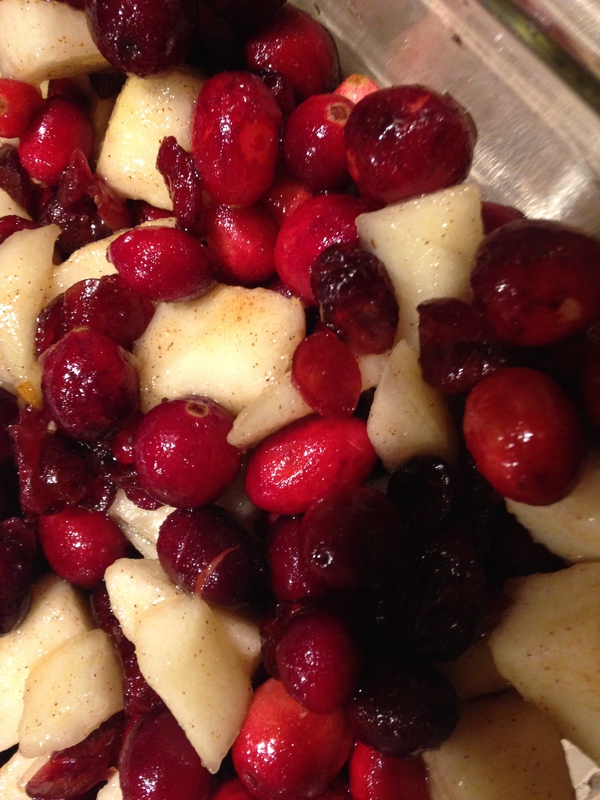 Lightly smash with a potato masher or fork to burst the cranberries. Add the pears, cinnamon, allspice and 2 Tablespoons flour and toss to coat. Transfer to a 3 quart baking dish. 3. 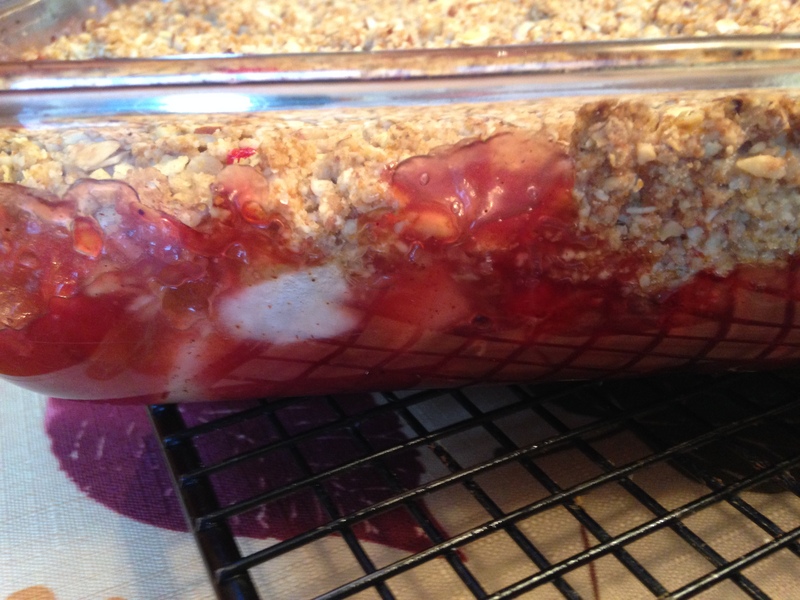 Bake until the fruit is bubbling and the topping is golden brown, about 40 minutes. Serve warm or at room temperature. This was extremely delicious and really simple. Took no time at all. Give it a try!! Thanksgiving is by far my favorite “holiday”. The main event is food. Sitting at a table with family and friends and eating a meal together. This year we have so much to be thankful for. We had some losses and we had some bumps in the road this year. However, on Thanksgiving day we were all sitting at the table together. We shared with each other what we are thankful for, enjoyed our meal, laughed and had great conversation. Sitting at the table, I was looking at these wonderful people that I love very much and so very thankful I have them in my life. I have been with my husband since February 1982. That would be over 31years. He has tolerated my insane Thanksgiving behavior for at least 15 of those years. Especially since we moved to Green Bay in 2011. I think that is when Thanksgiving became even more important to me. Needless to say, every year around August…yes, August I start slowly, gradually discussing Thanksgiving. Kent and the kids think I am absolutely crazy! (Really) I love to discuss the “menu”. Sometimes I start out by not wanting to have anything to do with the tradtional menu. I go on and on and on about the menu. No turkey here, let’s try ham or roast beef or whatever. (I, personally do not like turkey at all.) However, it just doesn’t seem to work that way. We always end up with the basic traditional menu. My big problem is stuffing. Yes, stuffing. 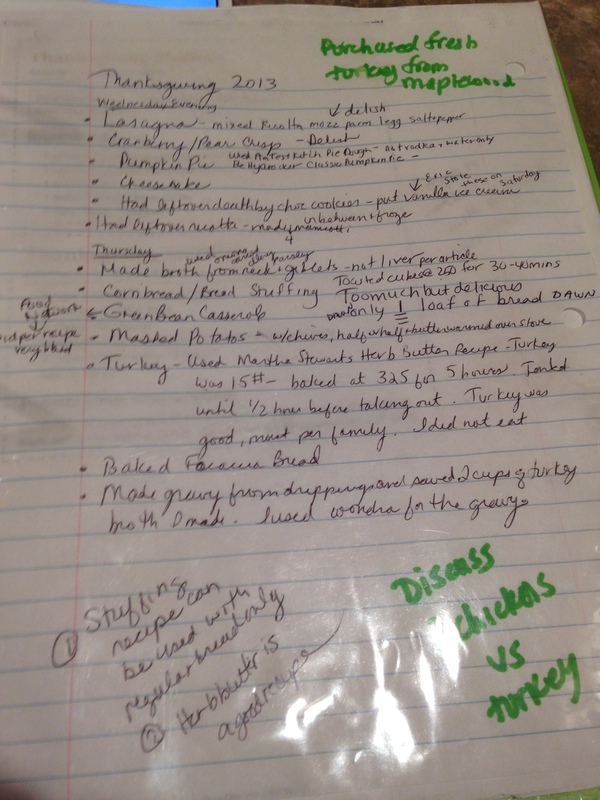 I go back and forth on what recipe should I use for stuffing. I ALWAYS make too much stuffing. I try so hard to make an amount that is enough for everyone to have but not too much left over. Last year I told Eric to remind me this year NOT to overdo the stuffing. He told Siri; “remind mom not to overdo stuffing this year”. Siri reminded him and he reminded me this year. I keep a list of what I do for Thanksgiving each year. I have done that for about 5 years now. In each of my handwritten notes (all over the place by the way) I have “DON’T OVERDO STUFFING” (in caps, just like that). Well, this year I decided to make a combination of cornbread/regular bread stuffing. Needless to say with the reminder from Eric, the mention of not making too much stuffing from Kent, I still made way too much stuffing. UGH! Leftovers are great. Kids having their own place is great too. They get to take the leftovers home! Martin and Martin opted for the dessert leftovers. Eric and Rachel came back the next day for the turkey/stuffing (yes, stuffing) leftovers. Stuffing is still in my refrigerator! Now that my favorite day of the year has come and gone my thoughts head towards Christmas. I think this year I would like to not buy as many presents as I do EVERY SINGLE year. I told the kids I was going to be good this year and not spend a lot. Small gifts, that’s it!